In the follow up to his book 'On the Other Side of Broken', Brian explores the ever-evolving, ever-growing link between leadership and mental health. His proposition is a simple one - that leaders who care about the health, wellness, balance, and success of their teams should strive to be 'Capital-L' Leaders. Capital-L Leadership is driven by people, not profit, and 21st century leaders who fail t… o acknowledge the increasing impact of mental health issues on their teams will inevitably lose the confidence and trust of those they have the privilege to lead. 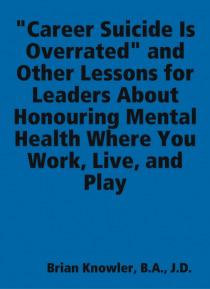 Through real-life lessons and experiences, including an on-duty injury in February 2018, Brian defines Capital-L Leadership and illustrates the importance of honouring mental health by powerfully interacting with those you lead (through good times and bad) in work, play, and life. Otros eBooks de Brian Knowler B.A. J.D.